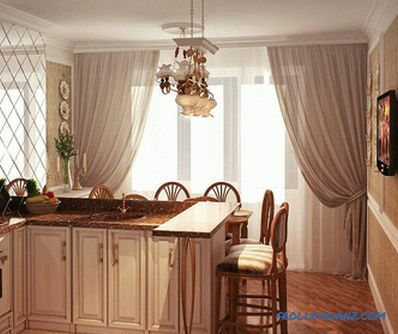 What should be the interior design of the kitchen? First of all, comfortable, ergonomic, thoroughly thought out. Interior design at a high level requires the infusion of significant funds and time resources. Repair begins with the creation of a design project, drawn by hand or in a special program. 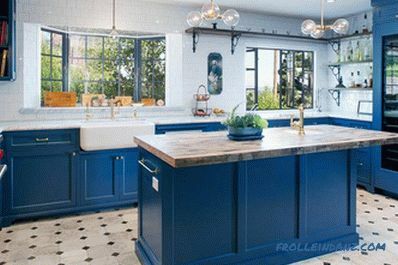 The kitchen, as a complex object for design, needs a preliminary interior design, perhaps more than other rooms, with the exception of the bathroom. Do not limit yourself to thinking through the design in your head; be sure to transfer your thoughts to a sheet of paper; correlate ideas with the actual dimensions of the kitchen. There may come to the surface some inconsistencies and difficulties in the implementation of design ideas. When planning the interior of a kitchen, it is not enough to decide on the decor and location of objects in terms of comfort. There are a number of factors that either will not allow the design project to be implemented in all its trifles, or it will require significantly more effort, financial resources and time than planned. It must be remembered that drawing up a kitchen design project is not only a creative process, but also an engineering work. Load-bearing walls. 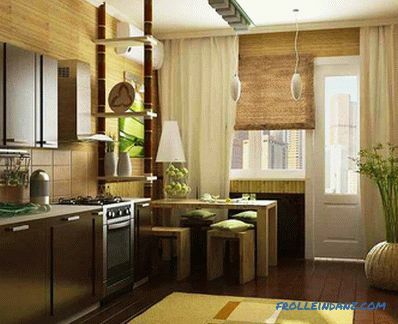 Not in all cases, you can expand the small kitchen, combining it with the living room. Sometimes you have to be content with the available square meters. Low ceiling. This item can adjust your tasks. It will be necessary to consider how to visually solve this problem. 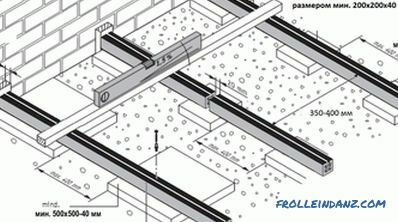 In addition, complex ceiling structures are not your case. Availability of sewage and water supply. The location of the kitchen sink is tied to the sewage system and plumbing, if you want to move it, you will need additional plumbing work. A large number of electrical appliances that require electrical power supplied to predetermined locations. Each switch and each outlet must be in strictly defined places. High humidity. 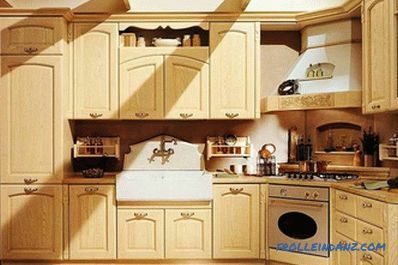 Good ventilation is required so that the climate in the kitchen is always comfortable. Gas appliances. 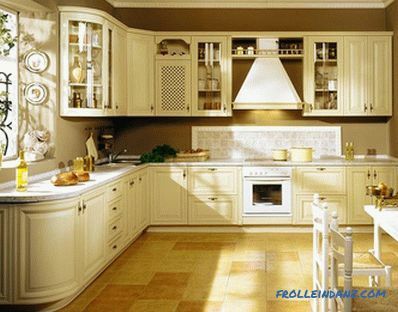 As you know, by law, the kitchen can not be combined with the living room, if there is a gas stove. Combining is possible only when replacing a gas stove with an electric one or installing a light partition. Temperature drops and fat evaporation. This factor influences the choice of finishing materials. They must be waterproof and washable. A lot of air and light. Great scope for creativity, the embodiment of designer finds. Viewing the space, which is good if the family has small children who need constant monitoring. 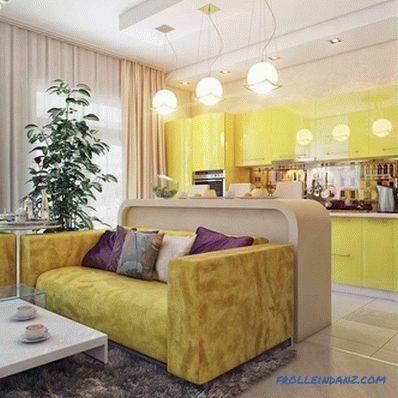 It is necessary to constantly maintain order so that the room looks presentable. Close the door to the kitchen upon the arrival of unexpected guests will not succeed. 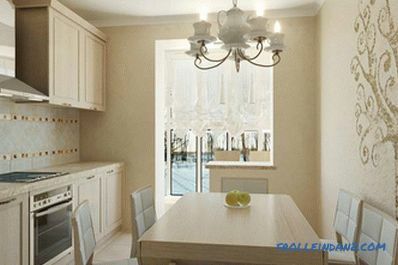 Standard kitchen (about 10 m 2 ). It is believed that the placement of such an area is quite convenient, especially if there is access to a balcony. In such a kitchen there is enough space to accommodate all the necessary elements of the interior: household appliances and furniture. However, one should not strive to embrace the immense, it is better to abandon something, for example, from dimensional furniture, a large number of cabinets and shelves. 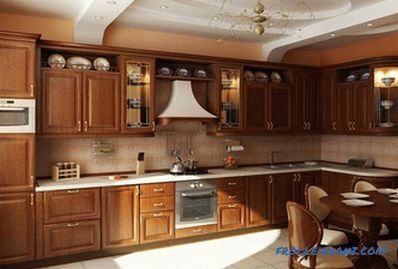 The shape of the kitchen is of great importance: rectangular or square. 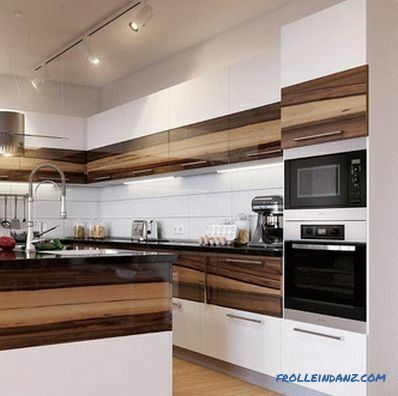 In a square kitchen an island zone would be appropriate, which can play the role of dining or working. 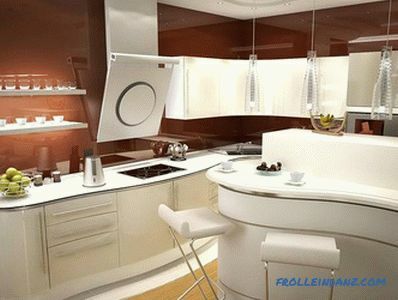 There is no place in the narrow kitchen of the island zone, it is rather difficult to place a dining table. The best option - at the window. Due to the difficulty in locating the dining area, some resort to redevelopment - combining the kitchen and living room. 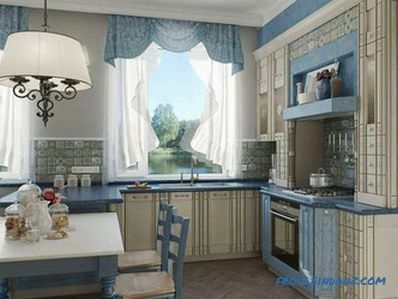 Small kitchen . 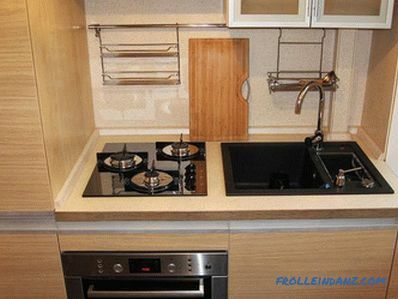 Preparing the project of the interior of a small kitchen will have to think carefully. In a limited space, it is difficult to combine aesthetics and functionality. We will have to pay a lot of attention to the choice of color and decor. Such an object requires separate detailed consideration. We will return to the conversation about the small kitchen. 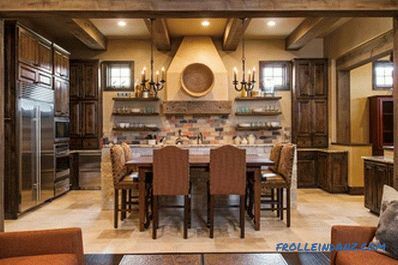 When designing an interior for a kitchen of any size, you should strive for ergonomics. The basis of the kitchen design project is a working triangle: a stove, a sink, a refrigerator. These three items should be located close to each other. It is known that colors affect the psyche and well-being person They can both invigorate and soothe, improve mood or be disheartening. 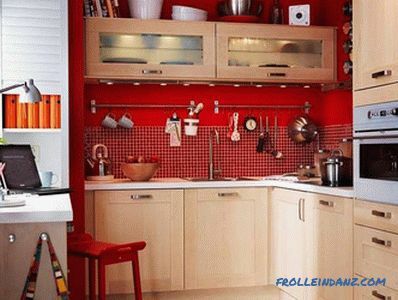 It is extremely important in what color your kitchen is framed. Indeed, in this zone, not only often they spend time, but also take food, which means that the color scheme will affect not only the psychological state, but also the physiological functions of the body. Red. Psychologists knowingly advise to avoid a large amount of red in the bedroom. This color acts excitingly on the nervous system and does not allow to relax. In the same way he will act in the kitchen. 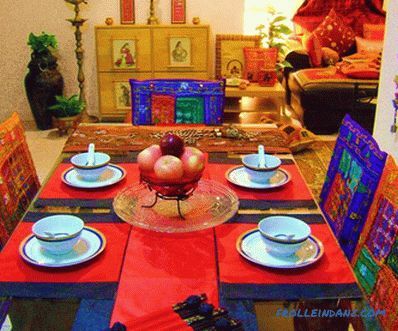 On the one hand, households will have a good appetite, the atmosphere will seem cheerful, on the other hand, a long presence in such an interior provokes headaches and nervous tension in susceptible people. It is suitable for extroverts, but introverts in the kitchen of red will feel uncomfortable. In addition, please note that the abundance of red increases blood pressure. 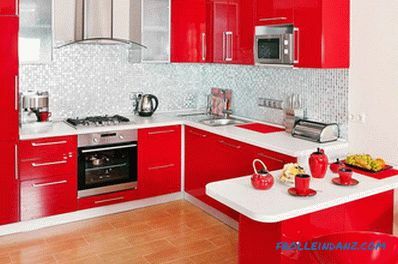 It is not necessary to apply in small kitchens, since this color visually approximates and weights objects. Often combined with white, gray, black flowers. Orange . The color of energy, positive and comfort. Mix well with calmer colors. It, like red color, increases objects, but at the same time they do not seem cumbersome. Great for more average kitchens, located on the north side. 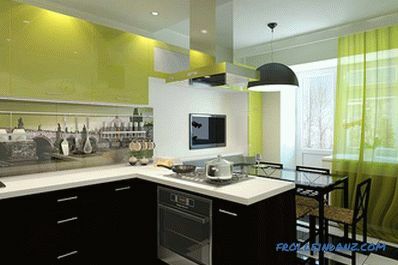 In the interior of the kitchen using a combination of white, black, milk, brown, blue and green. Yellow . 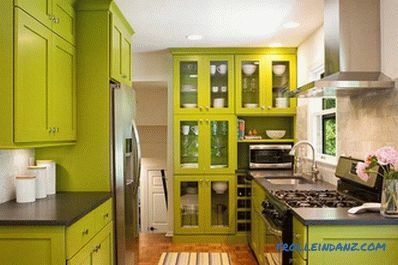 Cheerful color that literally glows from the inside and makes the kitchen sunny. By human influence, yellow is similar to red. It is better to use it in limited quantities, as it tends to bother. It is known that yellow goes well with the neighbors in the palette: orange, red, green. Successfully combination of lemon yellow and turquoise, yellow and brown, purple. Green . 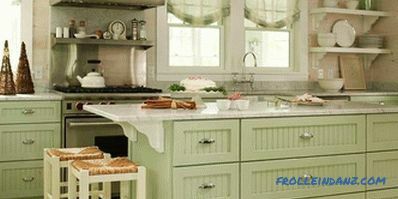 If in the kitchen you want to create a feeling of freshness, then this is what you need. Green can both invigorate and soothe. 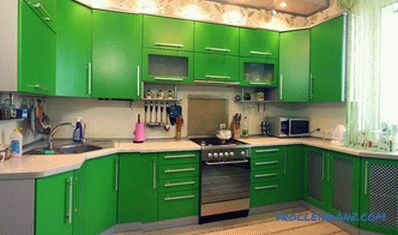 Green has many shades: muffled, with a yellow or bluish tint, with which you can create different moods. 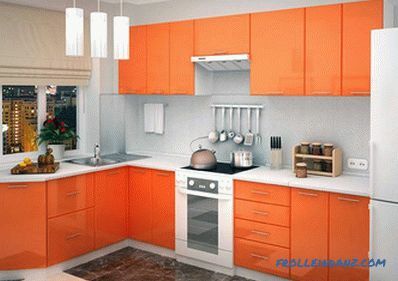 It combines with white, gray, beige, brown, orange and pink. Blue /blue. Blue is an elegant and strict color. However, you need to be careful with him. Despite the fact that this color has a positive effect on blood pressure, normalizing it, soothes and drives away stress, it, unlike red, orange, yellow, depresses appetite. In addition, when used in large quantities, it causes melancholy and depression. To avoid negative effects, blue should be combined with warm shades, for example, beige, bronze, orange. However, you can pick up light and airy shades of blue or aqua. In general, the blue color gives depth to the space and as if pushes the walls apart. Violet /purple. A bold decision for the kitchen. 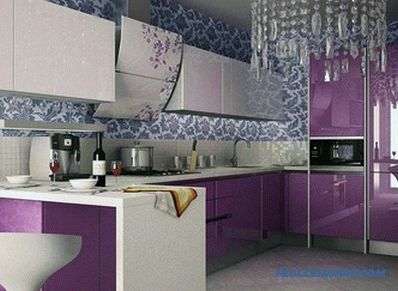 Each shade of purple, and many of them, is perceived in the interior differently. This is the color that requires good lighting, so you should take care of a sufficient number of sources of natural and artificial light. Dark shades of purple give a bohemian look to the room, lilac soothe. Remember that shades of violet do not mix well with each other, but they are in good harmony with white, gray, olive, chocolate. This color should not be used in small rooms. White . The white interior has both advantages and disadvantages. 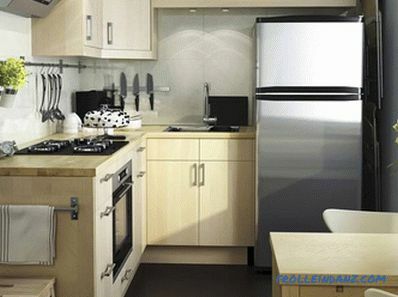 As for the benefits, the white kitchen looks larger than its actual size. With the help of white color, a simple or elegant interior in the style of high-tech, minimalism, classic, Scandinavian can be created. But such a kitchen is too marking, it will be necessary to restore order very often. 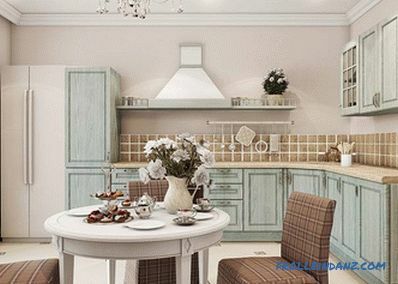 White kitchen is a clean canvas that can be decorated with bright accents. This color is combined with all the others. Black . 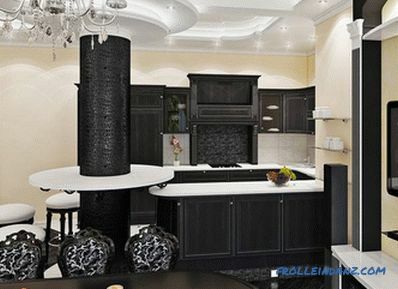 With this color you have to be extremely careful, perhaps, therefore, black is not used in design too often, mainly in modern interiors in the style of minimalism, hi-tech. 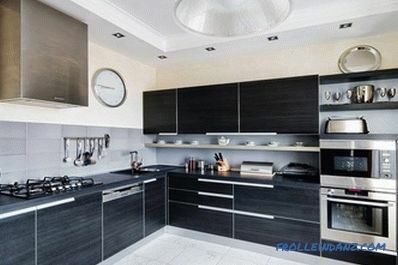 Especially controversial is his choice as the main kitchen.Black can be a lot, if, for example, the facades of the kitchen are made in black, or it can be introduced into the interior by separate inclusions. Black can be depressing, especially if the wrong choice of additional colors. He, like white, combined with all colors, but most often it is combined with light: with white, light gray, milky, beige. An important condition is good illumination. Gray . Gray has many shades: one can be warm, the other cold. The overall impression will depend on the texture of the surface and on other colors present in the interior, which will emphasize gray. Be careful the gray interior is easy to make gloomy. 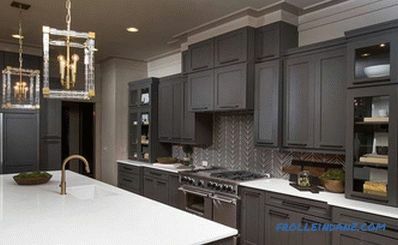 In the kitchen gray will look decor in bronze, gold and silver colors. Beige /brown. 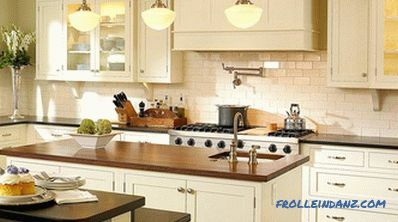 If you use mostly beige and brown colors in the interior of the kitchen, then it will turn out to be cozy and “warm”. Beige combines the best features of white and yellow and is devoid of their shortcomings. Like white, beige visually expands the space and invigorates like yellow. 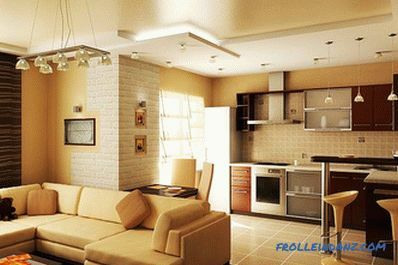 At the same time, the interior, made in beige color, is not too easily soiled and does not visually irritate. 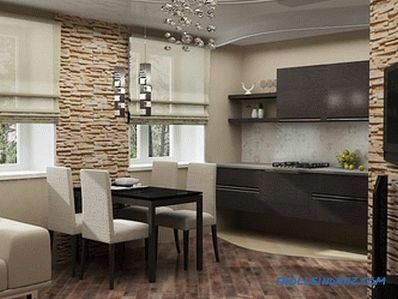 Brown and beige are suitable for interior design in a classic style, country styles and Provence. Having thought out the design project, having verified the colors of the future interior and the location of the furniture, try not to deviate from the planned one step. Otherwise, the result may be disappointing. But the scope of fantasy is not limited to them. 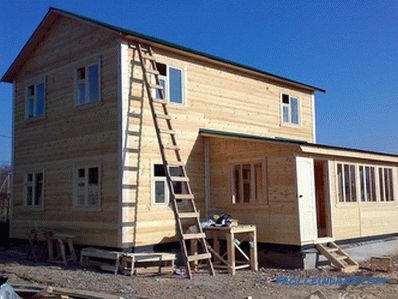 You can easily choose a loft, hi-tech, minimalism, Scandinavian style, contemporary or other styles. Country Style and Country Style are one and the same. It is characterized by attention to detail, because they form the style of country music. A distinctive feature is the environmental friendliness of materials. 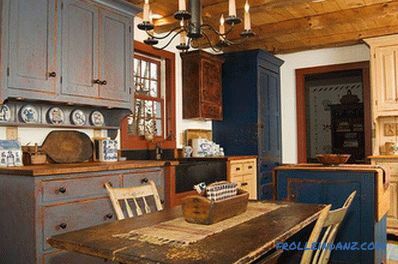 A massive and somewhat rough wooden kitchen set, specially aged, as well as wicker and wrought-iron furniture. Calm natural colors, such as the color of a tree. Use bright colors only as accents. Finishing with brick, stone, plaster, wallpaper with a small unobtrusive pattern - floral. The floor may be stoneware tiles. Earthenware, copper and wooden dishes as decoration hung on the walls or arranged on open shelves. You can also place jars with cereals, various boxes, woven baskets in the same place. Natural handmade textiles - two-color or patchwork, crafts. Forged chandelier - a frequent attribute of style. Artificial lighting of a warm shade. The main thing in country style is comfort and coziness. 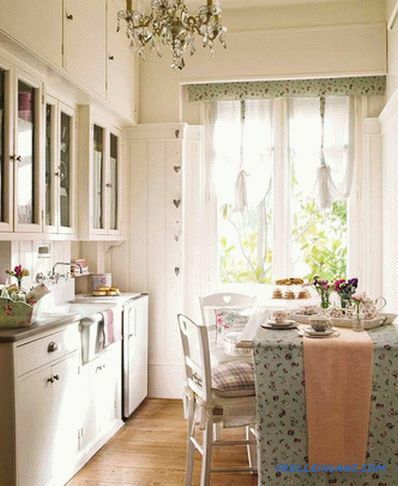 In general, country style is designed to recreate the atmosphere of the village hut. Predictable choice for conservatives. The classic style will never become obsolete, it looks great in the space of a large kitchen, although exceptions are possible. Emphasized respectable and solid. Characteristic linear arrangement of the headset. In the classic interior there should not be elements of plastic, if it is not an imitation of natural materials. A practically obligatory part of the interior should be a classical chandelier, perhaps even a crystal one. 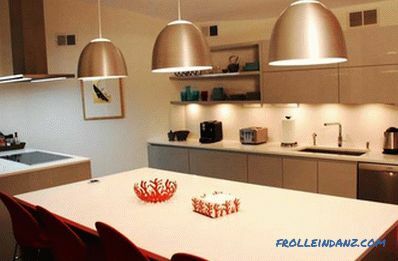 Spot lighting must be carefully considered if you do not want to give it up completely. Traditionally used expensive finishing materials, such as valuable wood, stone. 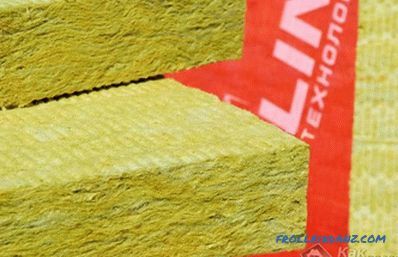 In order to reduce the cost of repairs using imitations of these materials. The colors of the classic interior are all in the range from white to brown, as well as golden, green, terracotta, light pink or blue. Luxurious style. And this is not only an appearance. 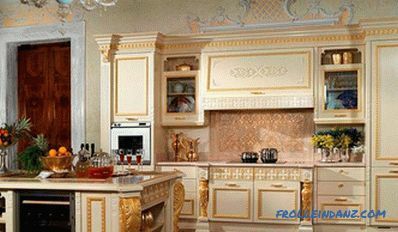 Art-deco kitchen design can only be provided by wealthy people, as furniture in this style will be expensive. Art Deco style literally screams about consistency. The combination of incompatible, eclecticism is typical: the intertwining of classic forms with technical innovations and modern designer finds. This is a mixture of elements of Empire, ethno, modern, oriental style. Valuable wood species, in particular wenge. 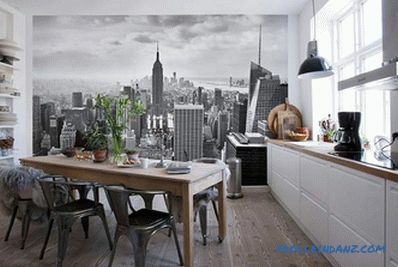 Decor in the form of black and white photographs, mirrors or paintings in gilded frames. 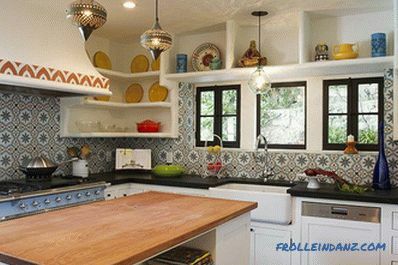 The combination of stucco, gold trim with a chrome oven or a glass-ceramic hob is not a move. But what to say, even the bar in this interior will be to the point. 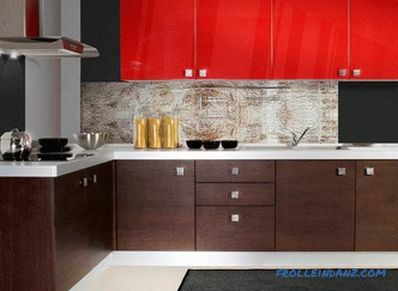 Along with the beige-brown gamut lilac and violet colors, dark shades of red, as well as white and black can be used. It is impossible to combine silver and gold shades in one interior. Blue, green and orange colors are not used. open shelves filled with dishes and jars, jugs, vases with bunches of herbs, in particular lavender, figures of cockerels. 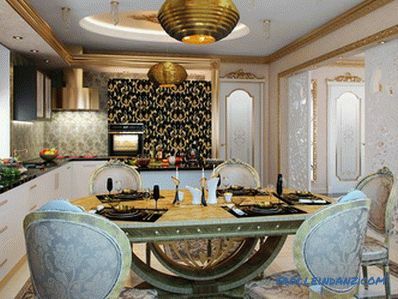 The walls can be decorated with beautiful plates. An abundance of braided, wrought, copper, lace, embroidered. textiles with floral or checkered patterns. The difference is manifested in the chosen color scheme. If the country is characterized by shades of natural wood, sometimes dark, then in the interior, decorated in the Provencal style, should be used light pastel shades, if the tree, then whitewashed. 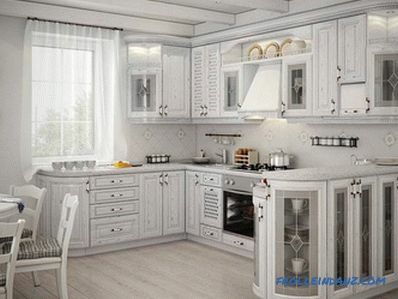 The predominant color is often chosen beige, blue or olive, but the kitchen can be white, and gray, and sand colors. Now, however, moving away from pastel colors and allowed, for example, blue or dark olive. As accents, you can use purple, bright yellow. 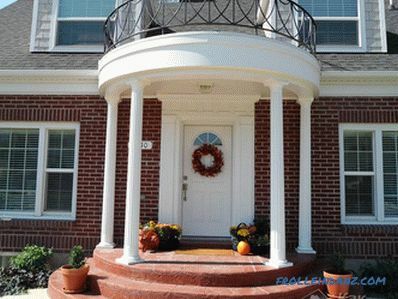 For finishing walls use plaster, brick, wood, paint. Wallpapers are used extremely rarely and locally. 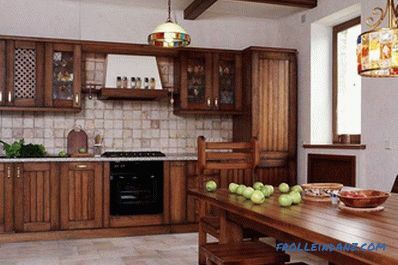 Kitchen facades are often decorated with carvings, stained glass windows, panels, decoupage, craquelure. Characteristic are wooden chairs with padded seats. 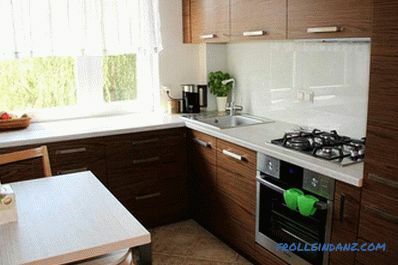 All appliances that look modern should be hidden from view. You can purchase "household helpers", the body of which is made in the Provencal style. Many manufacturers produce such. The worktop and apron are often tiled. Full compliance can be achieved by placing flowering plants on stands and on window sills; cuckoo clock on the wall; hanging the grass under the ceiling. Everything in the interior of the Provence should breathe hospitality. Ethnic style is diverse. The color scheme and the elements of decor - this is what creates the desired picture. They will depend on which ethnic culture is chosen. The kitchen is quite possible to create a corner of Japan, Morocco, Africa. 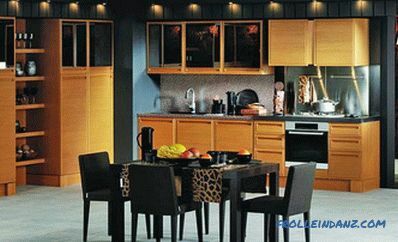 When creating an African interior kitchen using shades of brown, rare wood, such as wenge and zebrano, animal prints, black people figures. The apron with the image of the African savanna will perfectly look. Moroccan style, which also refers to the African, is rich in details. A distinctive feature are small geometric patterns, in which several colors are intertwined. The apron is often laid out with ceramic tiles with such a pattern. The Japanese style is restrained and simple. It is recreated using light rice paper dividers. In pots can grow bonsai.The walls can be decorated with hieroglyphs, fans, in the corner to put a large vase with flower arrangement. Lampshade chandeliers can be made of wood or rice paper. Choose a dark brown, red, beige color. Indian style is a Buddhist statues, batik, silk. The colors used are bright, vegetable. Characteristic are rounded lines, small and large pillows, multi-layer curtains. 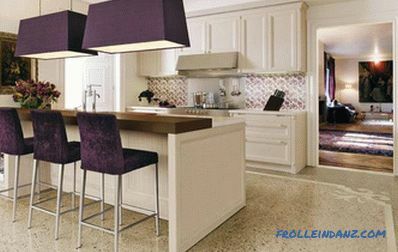 The floor can be made of porcelain stoneware or ceramic tiles with an ethnic pattern. Despite the fact that we are talking about the interior of the kitchen, a carpet will be appropriate here. Suitable for young and energetic people. This style is concise and devoid of fanciful details. The emphasis is on convenience and technical progress, so the interior looks futuristic. The functionality of all elements. 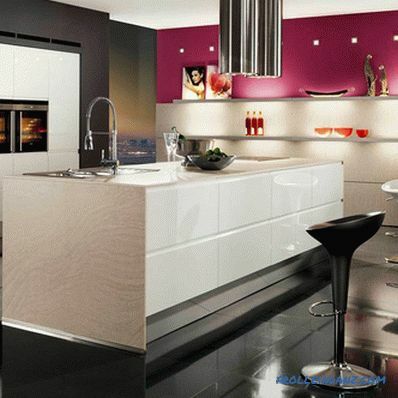 Smooth and glossy surfaces, in particular the fronts of kitchen units. Abundance of plastic and metal, glass. Wood can be used. The apron can be made of glass mosaic or glass panel with photo printing. As for colors, modern patiently refers to the most unpredictable contrasting combinations. occupy the leading positions. Often this is an interior characterized by strict lines and simplicity of forms. The focus in the kitchen should be on the kitchen set. If you ask for a design -project to professional designers, the cost of the project will also depend on the chosen style direction. Eclecticism is more expensive than classics. 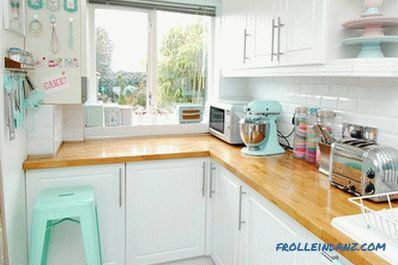 Small kitchens - this is not a relic of the past. 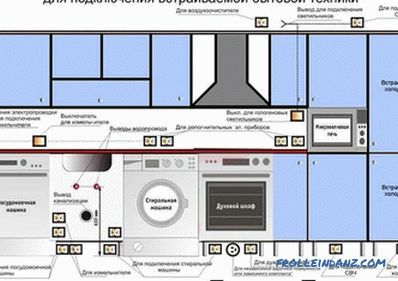 It seems that the small kitchens "staffed" only Khrushchev, but this is not true. 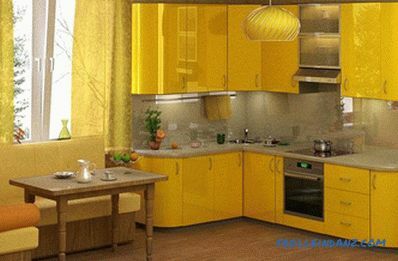 In some new buildings today, the kitchen is also small, so the interior design tips of a small kitchen will be relevant for a long time. 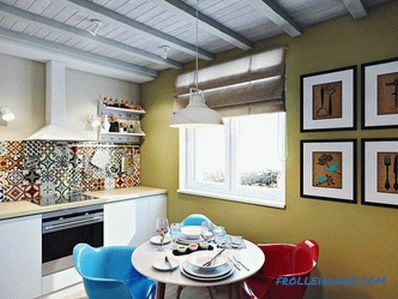 In a small kitchen, you can embody any style that allows the use of light shades. In particular, this is Provence and Country, hi-tech, classic style, Scandinavian, minimalism. Try to avoid sharp corners and bulky furniture. Choose built-in furniture, small models of equipment. Remember that with the help of mirror surfaces it will be possible to expand the space. The table can replace the bar. In addition, it can be reclining. Use the window sill as a work surface or move the sink there. Multicooker, microwave or food processor can find their place on the windowsill. More design ideas appear if the small kitchen has a balcony. His space is used in a variety of ways. The warmed balcony can become a winter garden, a continuation of the kitchen, where the dining area will be located; unheated - a place of summer recreation, a refrigerator in the winter. 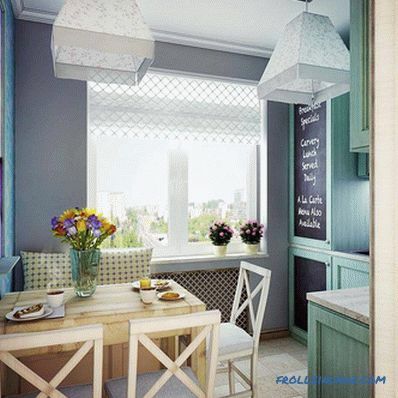 It is better to replace the door to the warmed balcony in a small kitchen with a sliding option or French glazing. Instead of a balcony block, a bar counter can be installed. 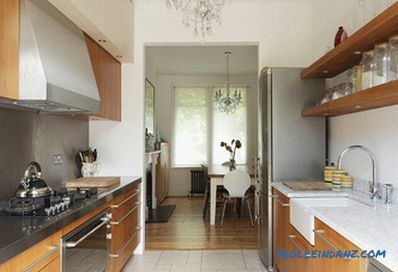 The main requirements for the interior of a small kitchen: functionality, practicality. 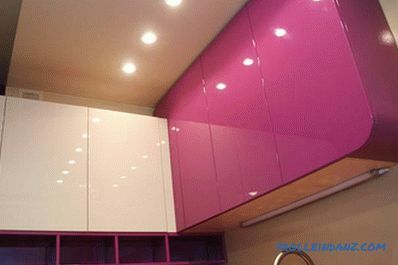 For example, hanging cabinets can be very high, up to the ceiling. 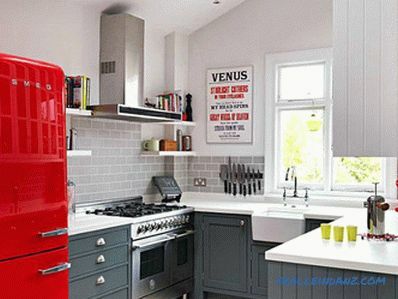 To leave it as it is, to be used for its intended purpose - you will need to replace the doors with more presentable ones and corresponding to the style of the interior; consider how best to isolate the refrigerator so that the cold does not penetrate the room. Make an ordinary locker, which is especially important if the window sill acts as a work surface. By the way, any technique can be located in a niche, for example, a washing machine. 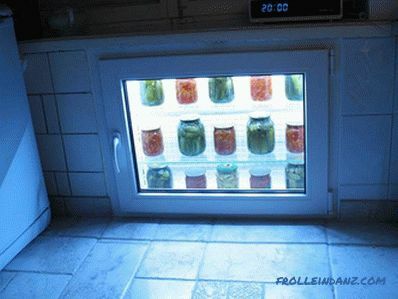 In this case, the refrigerator is warmed. To lay down completely, removing a niche or making it a small one, about 15 cm deep.There it is best to move the heating radiator so that it functions as efficiently as possible. 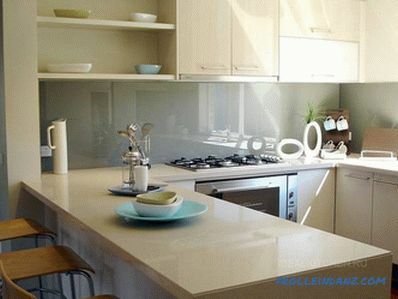 Remove the thin wall and make the floor glazing - the kitchen will be very bright. 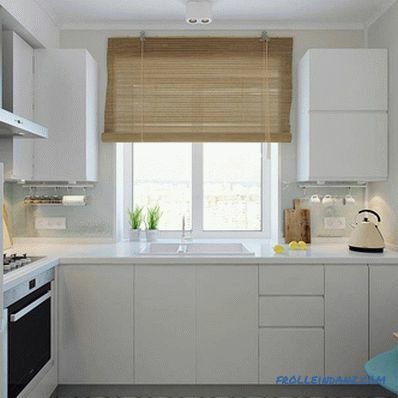 When designing a kitchen design try to avoid the mistakes listed below, or be ready for the fact that the failure to comply with the recommendations will complicate the cleaning in the kitchen or the process of movement. The convenient location of the working triangle should be exactly like this Linear location . 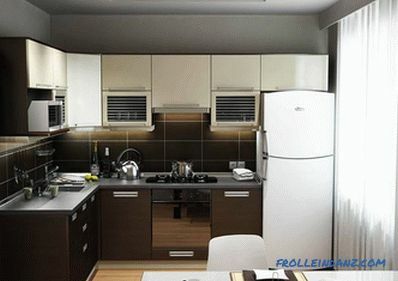 If the kitchen has a long wall, then many prefer to have all the furniture, including the refrigerator along this wall. This is a mistake, because the working triangle is called a triangle, because its three components must be located in different angles. 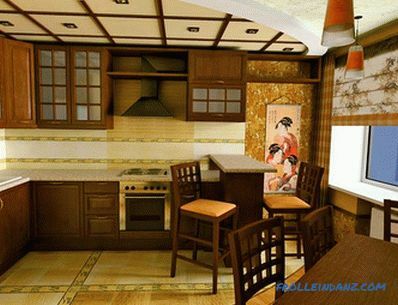 Linear location is relevant only in small kitchens. 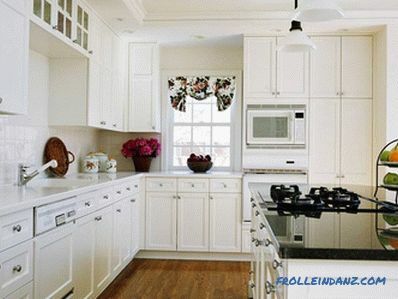 If the kitchen is quite large and long, imagine how many times you have to go from one end to the other in the process of cooking, it is much easier to place one of the elements against the opposite wall or as an island, then it will be enough just to turn around. 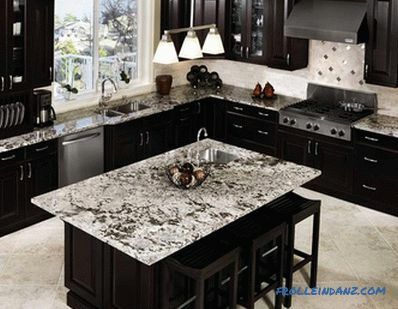 We need a working surface No working surface between the slab and sink or fridge . After the dishes are washed, it must be left somewhere to dry, when preparing food, put shovels, spoons, lids of pots or pans, and finally, products on the work surface. 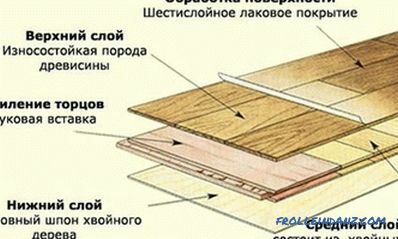 Without a working surface will be very uncomfortable. 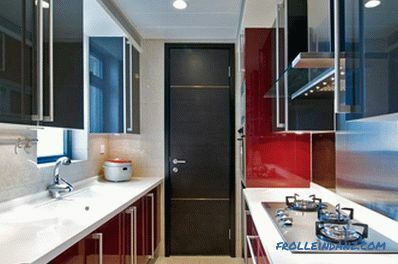 A narrow passage in a parallel kitchen is not the best option Narrow space . 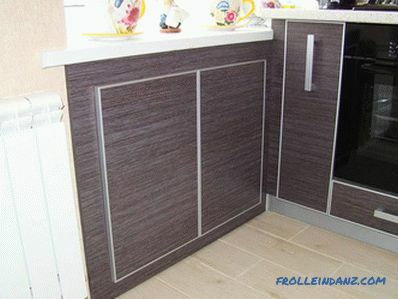 Between the kitchen and the island; kitchen set, placed on two sides; either a set and a dining table or a bar should be at least 120 cm apart. The lighting above each zone is more convenient Only central lighting . 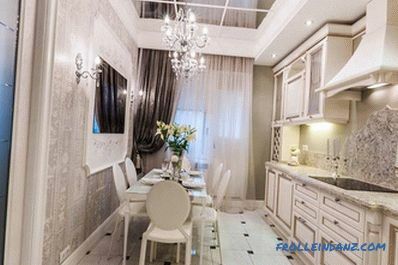 In the kitchen, there must be an illumination of the working area, if only because you can block the light from the chandelier when cooking or washing dishes. In order for glossy facades to shine so much, they will have to be washed every day Glossy facades and wooden floor . Such surfaces quickly become soiled and lose their attractive appearance. 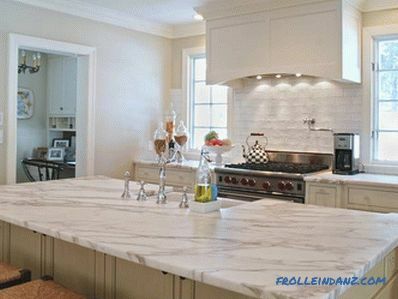 Marble surfaces are expensive, but impractical because of the porosity of the material Marble surfaces . Keep in mind that marble is a porous material, and this can play a dirty trick, for example, dyeing products spilled on a marble worktop or marble floor will leave a stain that is hard to remove. The optimal location of the integrated technology is at the belt level Built-in technology too low or too high. And again the question of comfort. All built-in equipment should be located at the belt level, because it will not be possible to rearrange it, placing it more conveniently. 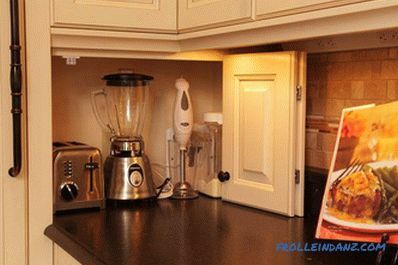 This niche is ideal for storing small household appliances There is no place for small household appliances . Practically no one in the kitchen now does without home helpers. 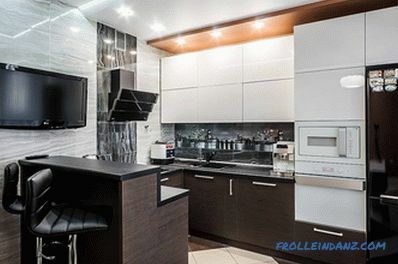 Provide free space for the placement of household appliances: multicookers, blenders, coffee makers, food processors and other things, even if now these devices are not. Perhaps in the future you will want to buy something. Can you keep open shelves in perfect order? 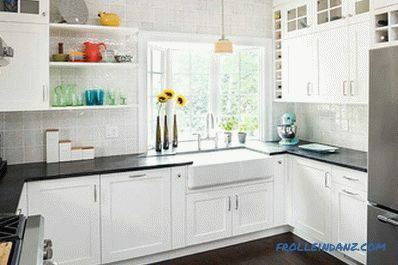 Open shelves instead of wall cabinets . 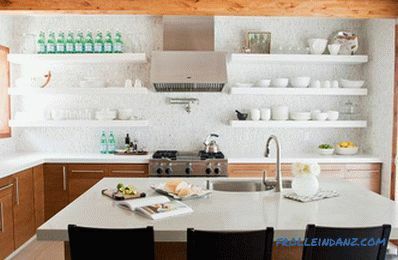 Many style directions allow open shelves in the kitchen. However, there is a great risk that over time they will be cluttered with unnecessary and not at all decorative objects. If you decide to open shelves, at least leave enough space for storage in the lower cabinets. The deep box will be spacious, but heavy Wide and deep drawers . Another detail that is often overlooked, trying to provide as much storage space as possible for all that is needed and not so much. 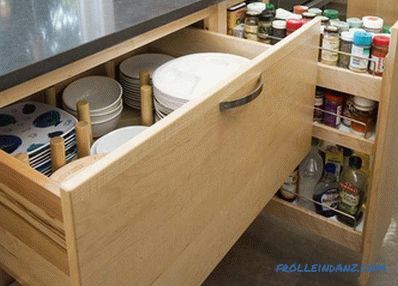 At first glance, it seems that the wide and deep drawers are functional. Yes, they will allow a lot to hide in their depths, but how heavy they will be - think about it.